Neighbors & friends: Please come out for this important event! The “Heroin in the Valley – Joining Together to Prevent Substance Abuse” community forum will provide info regarding trends, awareness, prevention, intervention & education. 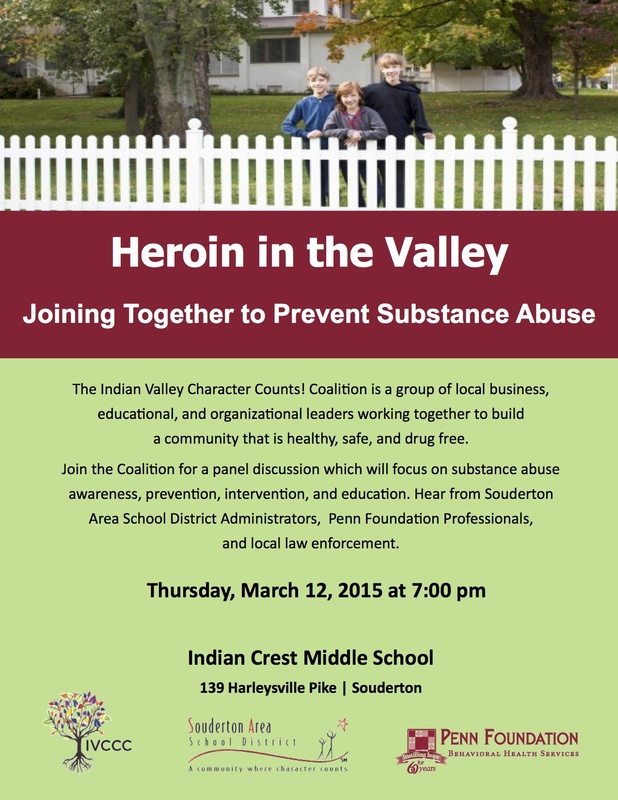 The event will be held this Thursday (3/12) at Indian Crest Middle School (139 Harleysville Pike, Souderton) at 7pm & is being sponsored by the Indian Valley Character Counts! Coalition. This entry was posted on Monday, March 9th, 2015 at 8:21 pm	and is filed under Event. You can follow any responses to this entry through the RSS 2.0 feed. Both comments and pings are currently closed.